Considering adding a land adventure to your yachting experience? We can help! There are a multitude of historical sites to visit, hiking for every level of fitness or just take the opportunity to see the beauty of Turkey. This ancient city was built in the 10th century BC and is famed for the Temple of Artemis that was completed around 550 BC. The temple is considered one of the Seven Wonders of the Ancient World. Close to Ephesus is the House of the Virgin Mary which legend says was where she spent her final days. The Roman Catholic church has not pronounced in favour or against the authenticity of the house however several papal visits and blessings have occurred, most recently by Pope Benedict XVI. In addition to these historical wonders there are many other things to see including the Library of Celsius, Hadrian Temple, Scolastica Baths, Mazeus and Mithridates Gate and much more. Pamukkale means cotton castle in Turkish. The flowing water of the hot springs located here leave amazing terraces of carbonate minerals. 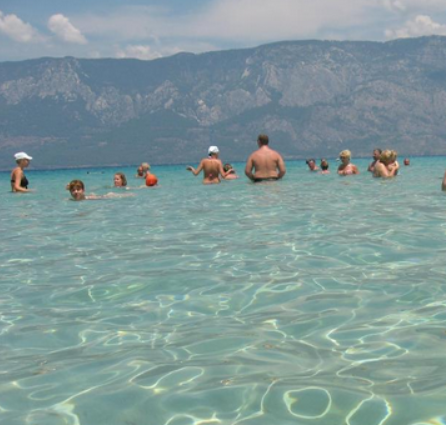 The water of Pamukkale is thought to have the powers to both healing and enhance beauty. The source of the hot springs is the underground volcanic activity. Dalyan offers a number of interesting things to do and see including Turtle Beach which is the breeding ground for endangered loggerhead turtles. Want to feel and look years younger? Take a mud bath then a dip in the sulphur springs followed by a relaxing swim in either salt or fresh water. Look up into the cliffs to see the Kings Tombs. 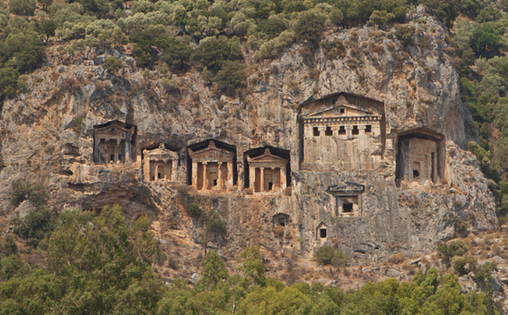 Amazing tombs cut into the rock facades circa 400 BC in the ancient city of Caunos. The tombs were originally built by the Carians and occupants may have been noblemen and rulers but were vacated and reused in Roman times. The largest one is unfinished and provides an insight of how they were constructed. The local volcanic mountains of Erciyes, Melendiz and Hasan has provided the base for unique rock formations located in Cappadocia. The volcanoes were active 2 million years ago. The formations are a result of thousands of years of rain and wind that has eroded the lava covered plain. . Due to the softness of the rock, Cappadocians carved out rooms and chimneys creating a fascinating underground city. The first populations believed to live in Cappadocia were in the 3000-2000 years B.C. This cove has a picturesque beach surrounded by pine-clad hills. 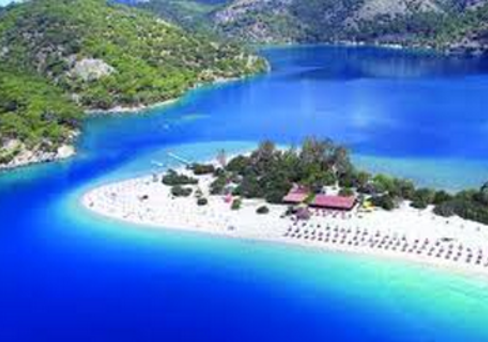 Oludeniz translates to “dead sea” based on an old legend. If you look to the skies you will see parasailers launching and gliding from the Babadağ Mountains and landing on Belceğiz Beach below. This parasailing adventure is rated as one of the best in the world. Not only is Datça a beautiful scenic seaside town but it is also close to the ancient city of Knidos. Aphrodite was associated with this city where a famous statue of the goddess once stood. While only copies of the statue exist, one in the Vatican Museum, the pedestal of the statue remains in the ruins. The views from the ruins are spectacular. The sands on this beach may have been brought there from North Africa by Marc Anthony for his love, Cleopatra. The sand on this beach is protected and is different from anywhere nearby, similar sand is found in Egypt The crystal clear waters will astonish you. There are multiple ruins on the island to explore including an amphitheatre. 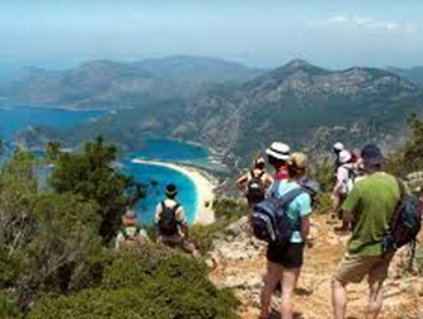 Imagine hiking and trekking through the hills and mountains of Marmaris. Whether you explore the history of Marmaris which dates back to 3000 BC or find a trail that will end up at a secluded bay, there is lots to do here for the active person. There are fascinating history tours through various villages like Söğüt, Taşlıca, Kırkkuyular and others. These villages provide breathtaking landscapes and an opportunity to experience local Turkish culture. Snorkelling along the quiet bays is a remarkable experience. Within the clear shallow waters you can see various fish, sea vegetation and amazing rock formations. Diving off the coast of Turkey is spectacular. The crystal clear waters and underwater visibility is spectacular. There are various diving options for both the beginner and experienced divers. A quick trip by hydrofoil from Marmaris to the Greek island of Rhodes takes only an hour and is worth the trip. The Colossus of Rhodes is one of the Seven Wonders of the Ancient World and its Medieval Old Town has been declared a World Heritage Site. The history of this island dates back to 16th Century BC and has had many centuries of history to intrigue you. Whether you investigate the ancient ruins or wander through the maze of streets filled with shops and restaurants in Old Town you will be enchanted by this wonderful island. Perhaps if you are connecting through Istanbul airport you can take a few days to explore this dynamic and enchanting city. This is the city's most unexpected attraction. There are hundreds of cisterns under the streets and houses of Istanbul. 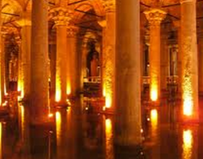 The Basilica Cistern provides a view of the complicated system that once brought drinking water into the palaces of Istanbul. It was constructed in the sixth century and then forgotten for centuries then accidentally rediscovered when it was noticed that people in the neighborhood would get water by simply lowering buckets into holes in their basements. This early 17th-century Blue Mosque is one of only a handful of mosques in the world to boast six minarets. Some legends say the six were built by mistake, the Sultan wanted gold (altin) minarets but was misunderstood and they thought he requested six (alti). The walls are papered with fine İznik tiles giving it the blue appearance. This mosque was built between 1609 and 1616 and the tomb of Sultan Ahmed I is located here. Sultan Ahmed I gave his name to both the mosque and the neighbourhood. The Bosporus is the 32 km (20-mile) long north-south strait that joins the Sea of Marmara with the Black Sea in Istanbul. It also separates the continents of Europe and Asia. 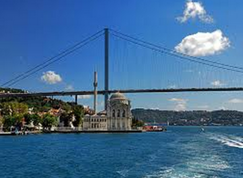 There are a number of cruises on the Bosporus that travel north toward the Black Sea that range in duration from less than 90 minutes to a few hours. This is a fantastic opportunity to sail past the palaces of the late Ottoman period an see them in their spectacular beauty. 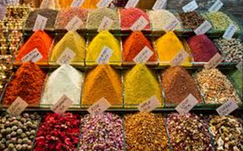 This exciting market, which was started in 1461, is comprised of over 60 streets, 5,000 shops and attracts between 250,000 to 400,000 people per day! Finding ceramics, linens, spices, jewellery, carpets and many other items is an experience you must have. Topkapi Palace was home to generations of sultans, their wives and families for approximately 400 years beginning in the 1400’s. The famous Imperial Harem were secluded here in a section that contained about 400 rooms. The secretive harem – really just the family quarters – is a maze of lushly-tiled rooms wrapped round a jewel of a Turkish bath.